Anglesey, Llanfachraeth WWI and WWII War Memorial. Llanfachraeth is a village on the Island of Anglesey in North Wales. 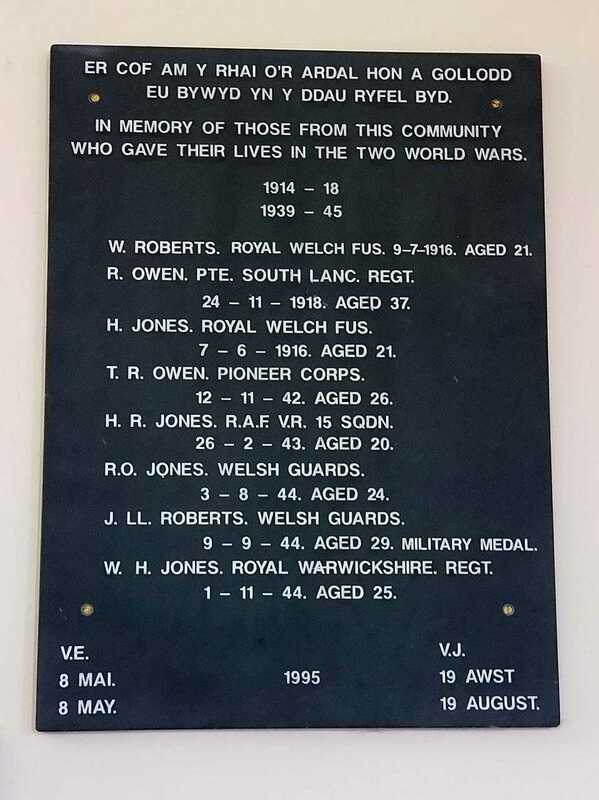 The War Memorials are located in the village hall, and cover Llanfachraeth, Llanfaethlu, Llanfwrog and Llanynghenedl. I have presented a little more information about the casualties in the table below, and I have added casualties from within the catchment area that are not on the memorial. Three of the casualties were actually buried at home, which normally means that they were sent home severely wounded or sick, only to subsequently die. Robert Owen is buried in Pont Yr Arw Chapel. Henry Jones Thomas is buried in Llanfaethlu Churchyard. Thomas Richard Owen is buried in Llanfachraeth churchyard. On the 21st December 1944, 3 months after John Llewellyn Roberts was killed it was announced that he had been awarded the Military Medal, second only to the Victoria Cross as an award for bravery. Cheshire Regiment - 5th Btn. Royal Air Force V.R. - 15 Sqdn. Royal Welsh Fusiliers - 8th Btn. Royal Field Artillery - D Btry. 231st Bde. Royal Welsh Fusiliers - 2nd/6th Btn. Welsh Guards - 2nd Btn. Welsh Guards - 1st Btn. Royal Welsh Fusiliers - 13th Btn. Royal Warwickshire Regiment - 2nd Btn.